First of all, I would like to express my gratitude to the Reef Central committee for giving me a chance to share my passion for reefkeeping and for choosing me to be one of the legendary Tanks of the Month. I would also like to thank the fellow reefkeepers who nominated my tank, and those who supported my work. To be featured as a Tank of the Month has been my dream and goal since day one, so when Skipper invited me, I was excited beyond words. I appreciate all the contributions made by past Tank of the Month recipients, who set a great example and guidelines for my tank. With every question or problem that I had throughout my reefkeeping journey, I could count on Reef Central's members for suggestions and solutions from their own experiences. For as long as I can remember, my family has been fascinated by the animal kingdom. While I was growing up, our family of six always kept pets of some sort. Even though I experienced numerous additions to and subtractions from our family's animal members, one thing was always constant - the goldfish tank. Within walking distance from where I lived in Hong Kong is a street named Goldfish Street. Although the street is renowned for its assortment of fish stores, it is even more famous for having the best selection of fishes. As a young school aged boy, feeding and caring for my family's goldfish tank were my duties, and even at that young age I was mesmerized by the fishes' movements and colors. During the '90s I went to a university in Perth, Western Australia, where I could see the ocean any time I wanted to. 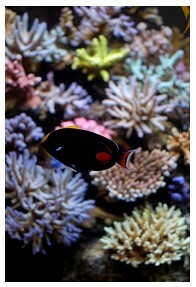 I remember one road trip down to the east coast, when I had the opportunity to dive at the Great Barrier Reef. Boy, you should have seen the look on my face! Never have I seen so many colors and diversity of life, and there was something to notice at every turn of my head. That diving experience impacted me deeply, and little did I know that, one day, I would come to have a little piece of the Great Barrier Reef in my own home. After finishing my studies I immigrated to Canada with my family. During one of my visits to the local pet store I bought a five-gallon goldfish tank, complete with all the works. After a few months this tank was replaced by a freshwater tank housing a few mollies, angels and some tetras. After frequent visits to various local fish stores, my wife and I could not help being drawn to their saltwater sections. The magnificent colors and the diversity of forms instantly captured my interest; I saw many similarities in shapes between the fish from the local fish store and my dive at the Great Barrier Reef. The freshwater tank phase was quickly replaced by my first 50-gallon saltwater fish-only tank. 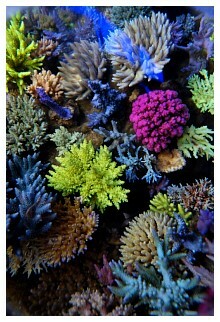 Soon thereafter came a 72-gallon soft and LPS corals tank. Following a few years of keeping soft corals and LPS, I was attracted to the world of small-polyped stony corals, and wanted to challenge my husbandry skills. My first SPS-dominated tank was a small 20-gallon system and when the corals outgrew the tank’s limited volume, an upgrade to a 90-gallon was necessary. 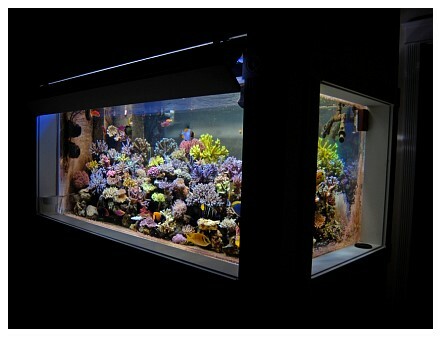 We then moved into a new house where I could set up the tank of my dreams - a 320-gallon replica of the natural reef that could incorporate my rapidly growing corals. 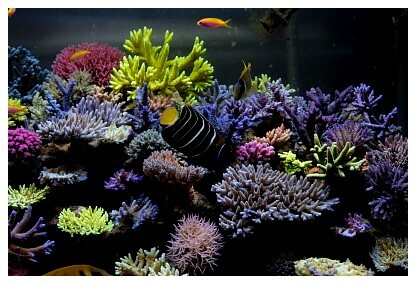 Right from the beginning I planned to have a tank containing a large variety of fish and corals. 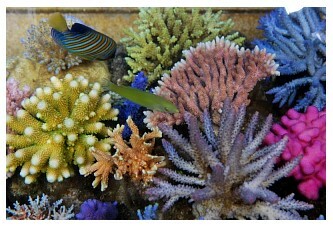 The fish brought movement and life to the tank, but they also added diversity and individuality to the system by providing colors and patterns that are not found in the corals alone. With so many friends and relatives visiting throughout the year, the aquarium plays an important part in entertaining them. 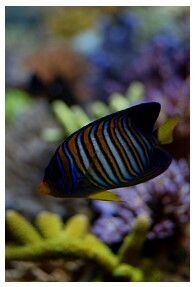 Although most everyone is charmed by the brilliantly colored corals, the fish are what hold their gaze and interest. The theory behind my system is to create a balanced and harmonious atmosphere with corals and fish, and to duplicate the natural reef as closely possible. Bearing these concepts in mind, I started on the journey to achieving my dream tank. A tank packed with both a large number of SPS and fish is extremely challenging to keep, and after conducting extensive research over the Internet, I decided make this a bare-bottomed system. 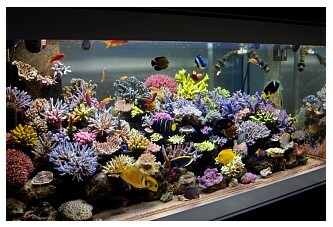 With a heavily stocked fish and SPS tank, the notion of aggressive nutrient export sounded to me like the best solution. Also, it comes with the benefit of not having to worry about disturbing the sand bed when direct current flow is applied. In order to maintain water quality, fish waste is prevented from breaking down as much as possible. The flow pattern is designed to keep all particles in suspension, directing (not breaking down) the fish waste to a specific area where I can easily siphon it out every other day. Moderate flow is applied to either siphon waste out manually or remove it by wet-skimming and frequent water changes. My fish are fed (lightly) at least 8-12 times each day, keeping them all a little overweight and healthy. This may be considered a heavy feeding regime, but I try to ensure that all the food is consumed within a minute or so. I also try to make sure that no food is sucked into the overflow box. Chaetomorpha algae are used to remove extra nutrients from the aquarium, and are cleaned weekly by rinsing. 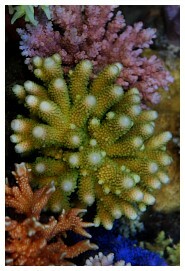 The only invertebrates in the system are four urchins and one Coral Banded shrimp transferred from the previous tank. I have decided not to include any snails, mainly because they would increase the system's bio-load. The fish in my display act as grazers to clean up the live rocks and the tank. As mentioned earlier, the current system was set up approximately two years ago, when our family first moved into this house. Prior to setting up the tank, the plan was drafted on paper to get an estimation of the whole construction project. I jotted down all the equipment, light fixtures and materials I would need to build the tank from scratch. The tank was built into the wall, so all the equipment would be hidden; only the front and right side are accessible for viewing. 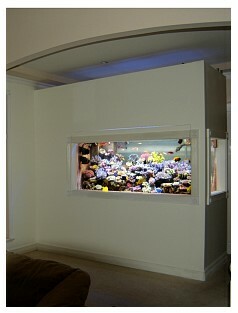 The wall was painted a lily white and the trim kept simple so the tank would be the center of attention. The tank’s dimensions are 72” x 32” x 32” (L x W x H) and its acrylic walls are ¾” thick; it contains approximately 320 gallons of water. An internal overflow box with two 1” returns resides in the left rear corner of the tank. The opening of the panel sitting above the tank measures about 72” x 10” and can be opened conveniently for easy access and maintenance. The stand supporting the tank is custom made, assembled from 2” x 6”s, with roughly 24” between the back of the stand and the wall, to provide access to the tank from behind (photo above left). A 1” Styrofoam board is placed between the tank and the stand to help distribute the tank’s weight. 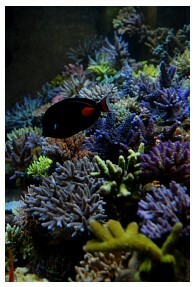 The tank’s back wall is left clear, so I can easily monitor the corals’ condition. The fish room, a separate area where I do most of the tank-related work, is positioned behind the wall of the aquarium’s room and is approximately 100 ft2. The fish room was originally a Chinese kitchen in the floor plan of my house before I claimed it as my own working area for the aquarium. Behind the main tank’s wall is the fish room; the system is connected through that wall, making it very convenient for water changes and maintenance. 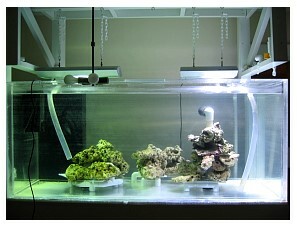 All equipment is located in the fish room for easy access and maintenance. 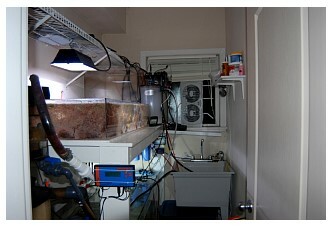 A 180-gallon sump (72” x 52” x 32”) is placed underneath the stand, and the coral fragment/quarantine tank is placed on top along with a 40-gallon acrylic cube tank used for water changes. 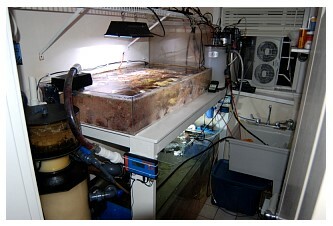 The calcium reactor and kalkwasser dosing unit sit in front of the cube tank, and a small working area in front of the coral fragment tank is used for testing and coral fragmenting. 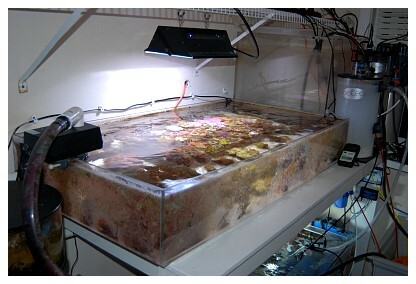 The sump has a small acrylic box clipped onto its sides that houses a small amount of macroalgae. A 15-gallon Rubbermaid bin is used as an RO/DI water reserve for the auto top-off system. 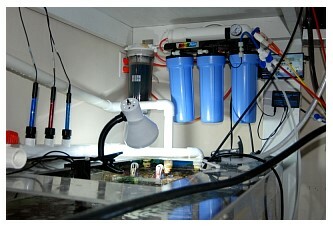 The skimmer sits on a small table to the left of the sump. My intention when setting up this tank was to create a “virtual ocean,” thus making the tank look bigger than its actual measurements. Everything is also placed at eye level or lower for easy viewing. After various attempts to set up the tank's aquascaping, the live rock was modeled like two staircases built parallel to each other, with a gap between them for the fish to swim through. At the base of the aquascaping three PVC docking stations are held in place and stabilized by large rocks, with their slopes slightly angled. When I initially set things up, I glued the corals, two or three at a time, onto smaller rocks, but without overcrowding the tank and leaving at least six inches between the corals. Intervals remain between the rock stations to establish a more spacious atmosphere. 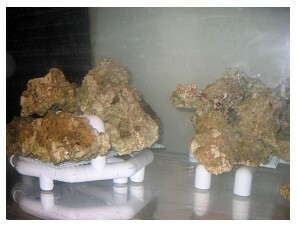 The live rock does not contact the tank's sides, and only a tiny portion of the rocks are placed directly on the tank's bottom. The rest are positioned above the PVC stations, allowing flow to circulate easily. I tried to leave more open spaces at the top portion of the rockwork so the coral's growth could be maximized horizontally and light would spread more evenly. The back of the rock landscaping was also left open to provide lots of hiding spaces for the small fish, so they are not intimidated by the more aggressive fish in the tank. Because my tank is mostly SPS-dominated, the lighting arrangement plays an extremely important part. 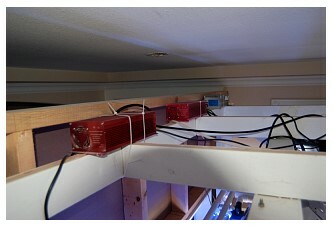 It is also critical that the lighting be easily accessible for occasional adjustment and maintenance. All of the lights are suspended by chains from a custom-made rack constructed of 2” x 4”s. There is approximately 5” of space between the lights and the water’s surface. 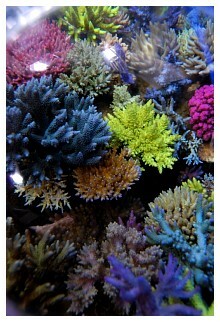 Because the corals are placed at least 16” beneath the water’s surface, reaching less than halfway of my 32” high tank, the lights selected had to provide large and deep coverage. The Lumenarc III reflectors are used to maximize coverage area, and they are equipped with three XM 10000K 400-watt mogul base single-ended metal halide bulbs powered by two CoralVue electronic ballasts and one Icecap electronic ballast. This lighting combination produces a whitish color and seems to generate plenty of light. 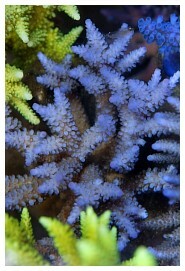 The XM bulbs also offer the high PAR levels necessary for the corals’ growth. Dawn and dusk are simulated by the use of two 54-watt T5 HO ATI Blue Plus bulbs on Tek ballasts. The XM’s photoperiod is controlled by a timer, which turns on at 10:00am and off at 9:00pm. Also on timers, the T5 supplementation turns on at 9:00am and off at 10:00pm. 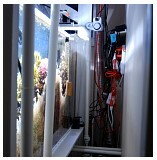 With so many new technologies and options on the market, aquarists have to be careful when choosing new equipment. 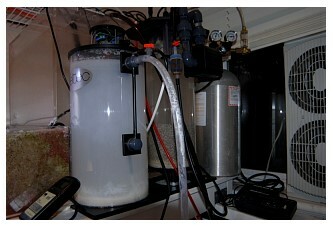 To handle the high bio-load from all the fish in my tank, a filtration system with aggressive nutrient export is a must. Biological filtration is accomplished by approximately 300 lbs of live rock. Prior to their placement in the system, the rocks were “cooked” for six months. I chose an oversized skimmer for its ability to export large amounts of nutrients and waste. It is rated for two times my system's total water volume, and it’s adjusted to produce wet skimmate, filling the collection cup every two days. The skimmer is fed by a Mag-Drive 9 pump located in the sump. Additional chemical filtration is provided by a Deltec FR509 fluidized reactor (photo right). The reactor is filled with 1 liter of RowaPhos and is fed by a MaxiJet 1200. This helps to ensure a low PO4 level, which typically runs below 0.03. Calcium and alkalinity are maintained by a Deltec PF601 calcium reactor filled with Rowalith C+ media, and the effluent typically runs around 60-70 dKH. The reactor is fed by a MaxiJet 606. A Pinpoint pH monitor is used to control CO2 injection, which is set to go off at pH 6.2 and on at pH 6.4. The reactor’s pH usually stays between 6.25 - 6.3. 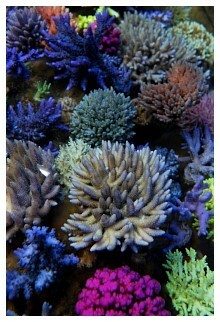 As the demand for calcium and alkalinity increases with the corals’ growth, I add an appropriate amount of Kent Marine SuperBuffer dKH and Kent Marine Turbo Calcium. A Deltec KM500S kalkwasser stirrer provides extra alkalinity and calcium for the system. It also helps to increase pH in order to offset the low pH of the calcium reactor's effluent. The stirrer is controlled by a Litermeter III, which doses roughly eight gallons per day and runs continuously. Automatic top-off to replace water lost to evaporation is handled by a Tunze Osmolator. All source water is filtered by a SpectraPure five-stage 75 GPD RO/DI system. Even though the tap water's TDS level is only around 14ppm in my area, I still make sure the source water for my system is in pristine condition. The total dissolved solid level is tested with a COM100 TDS meter. One of the key components to running a bare-bottom system is to create strong circulation, keeping all the detritus in suspension where it can be removed either by wet skimming, manual siphoning from the sump or suctioning a particular area where the detritus is intentionally directed. The strong flow produced by two Penductors via the return pump and the two Tunze 6100 Stream pumps is arranged to create mass water movements circulating in one direction. The Tunze Wavebox is operated to provide water flow in a back and forth motion, the Tunze 6100 Stream pumps create pulse-like water movement, and the two SeaSwirl devices contribute to random flow. 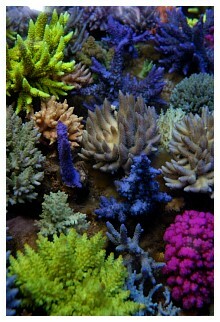 Using this scheme allows all the corals, along with all areas of the tank, to receive proper moderate flow. 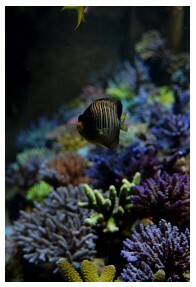 The fish seem to enjoy the current-like motion as well. 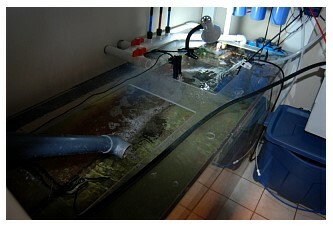 System: The sump is siphoned during the weekly 40-gallon water changes. Detritus is siphoned from the corner of the tank every two days. All the PVC pipes are replaced yearly. 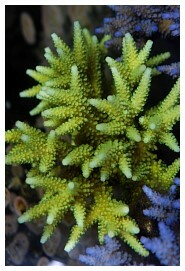 Instant Ocean Salt is mixed with RO/DI water for water changes. Skimmer: The neck is wiped and cleaned every three days. The whole skimmer and all the pumps are cleaned thoroughly using Ezeclean every three months. 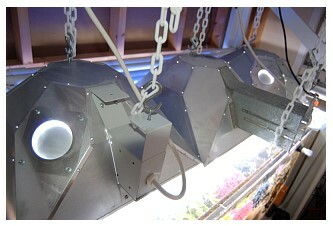 Lighting: The bulbs and the insides of the reflectors are cleaned every month. Every 10 months the bulbs are replaced. Tank: The front, side and back acrylic panels are cleaned every three days using a Magnavore 6 algae magnet cleaner on the front and two Tiger Shark Float algae magnet cleaners on the side and the back of the aquarium. 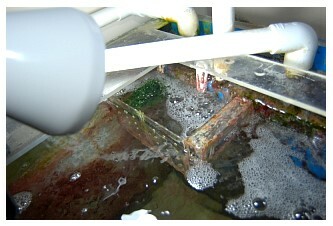 The internal overflow box is cleaned during the weekly water changes. Frag/QT tank: Detritus is siphoned every two weeks. Pumps: The two Tunze 6100 pumps' intakes are cleaned weekly using a tooth brush. The Tunze wavebox is cleaned out every month and the main return pump is cleaned every six months. The Dart pump on the closed-loop system is cleaned every two months. RO/DI unit: The sediment filters and carbon block filter need to be replaced every six months, and a disinfectant is used on both housings at the same time. The de-ionizing unit’s stages 1 and 2 are replaced when the TDS level increases to 1-2ppm. Detritus removal: I try to make sure that no detritus or fish waste settles at the bottom of my tank. 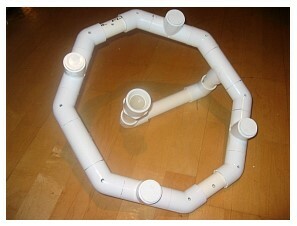 The only exception is at the corner where I designed the flow pattern to direct all the waste toward. 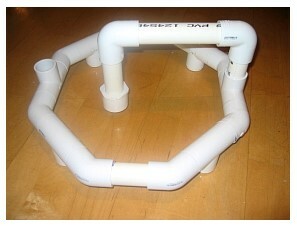 This enables all the detritus and fish waste to be easily and regularly siphoned out. Manual nutrient export is an important part of the tank’s maintenance to continually maintain water quality. Properly locating two Tunze Stream pumps in the tank provides sufficient flow for all my SPS. At the same time, these pumps provide enough flow to keep all particles in suspension, also directing (but not breaking down) some fish poop to a particular area where I can easily siphon it out of the tank every other day. Monitoring: A Neptune AquaController 3 Pro is used to monitor the system's pH, temperature, ORP and conductivity (water parameters shown at right). 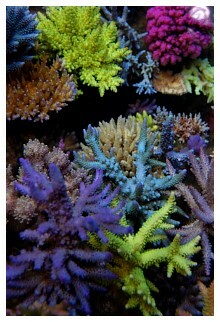 The alkalinity is normally checked two or three times per week, because it is a very crucial element for my SPS corals. The calcium level is monitored every two weeks. 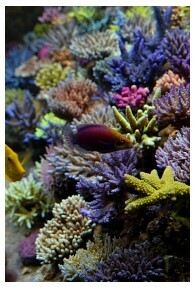 The corals’ and fishes' condition is carefully observed daily. 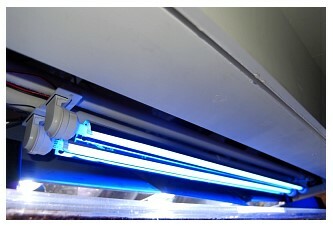 Temperature and ventilation control: The weather here is generally moderate, so no heaters are required. 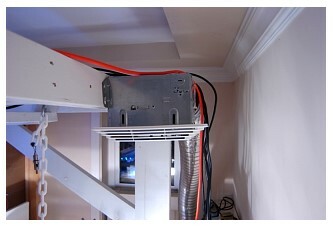 Even during winter when the temperature falls below 0° F, the tank’s temperature manages to stay above 76° F. During summer, a fan is used to blow continuously at the sump to lower the temperature, which stays around 80 to 84° F. A bathroom fan is installed under the top of the light rack, and is used to vent hot air outside the house. 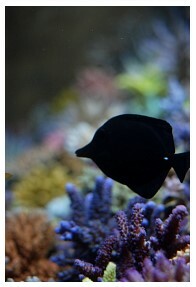 The window in the fish room is always open, with a fan blowing fresh air inside. Observations: I always pay close attention to the polyp extension on all my SPS, and usually monitor it during the night. It is a part of my observations to determine their health. What interests me the most about SPS are their unpredictable changes and the outcomes that they achieve. 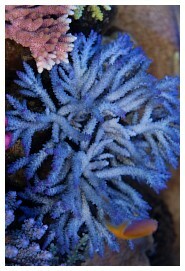 Many factors, such as water quality, lighting, flow and placement, can tremendously affect the corals’ colors and growth forms. The color morphs that can arise after I acquire a new piece are also something that makes me very excited; the dullest pieces sometimes turn out to be the brightest pieces in the tank. 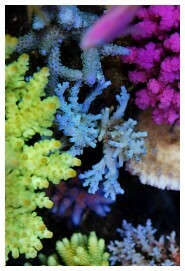 Some SPS fragments collected from the wild are a challenge to keep and "color up," yet they often are much more rewarding in the end, as they seem to grow more naturally in form than some of the cultured SPS. Most of my fragments were collected from local hobbyists when I first started keeping SPS three years ago. Approximately 50% of my SPS were acquired from frag swaps, hobbyists and private collectors, and the rest were purchased from local fish stores. At this time I have over 200 pieces of SPS in my collection, and every piece is unique in its own way, whether in form or color. 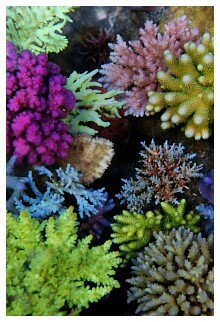 I try not to have any duplication in my coral selection. 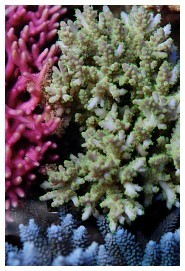 Identifying coral types and knowing their needs - lighting, water flow and growth patterns - are the key criteria to follow when placing corals. 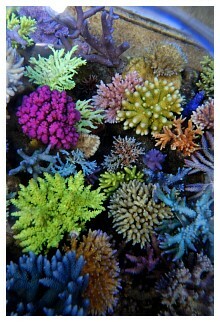 Based on my observations and research, I realized that the corals would eventually grow into one another in a matter of time. Taking this into consideration, I stationed them no less than 6” apart when initially placing them to maximize their horizontal growth; the rocks were placed further down to maximize the space available for vertical growth and to ensure limited restriction of water flow. 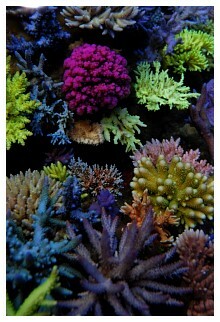 Corals with primary and secondary shades on the color wheel were deliberately placed to complement each others’ colors. I tried not to overlap their placement if the colors or growth form were similar. 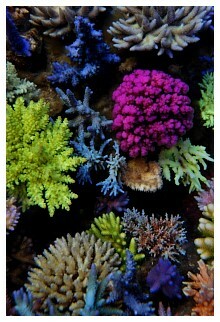 Each coral was strategically placed so that it would not cast a shadow on the corals placed underneath it. Most of the stag-like structured SPS were placed near the tank’s top on the left side, acting as camouflage to hide the black outer shell of the overflow box, and the rest of the stag-like pieces were placed on the top right side because they grow extremely rapidly. Deep water pieces were positioned lower down on the edges of the rocks to get the proper light exposure and to allow them to grow naturally. 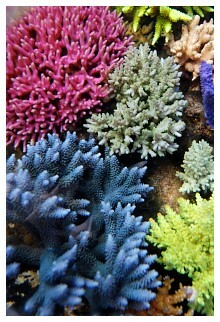 Montiporas, chalice corals and corals with flatter shapes were placed at the lowest part of the tank at an angle to show off their colors and patterns. 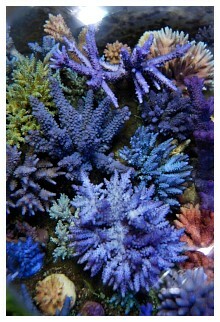 The corals’ growth has been exceptional and their colors seem to be getting more and more intense over time. Over the past few years I have collected quite a few rare and exotic pieces; most were grown from one-inch fragments, with some measuring less than half an inch in size. Presently, almost all of them have grown into colonies with their “true” colors showing. 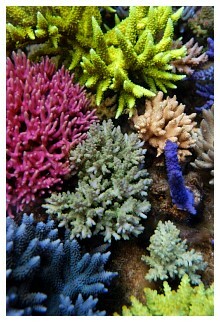 It is always fun to compare these corals over the Internet with others who own the same ones. The fish collection was carefully planned after reading a lot of materials; their behavior, reef suitability and personality were considered. The exact order in which the fish were added was planned to maximize their survival rate and minimize conflicts. I never buy a fish if I don’t think it will survive in my tank in the long run. 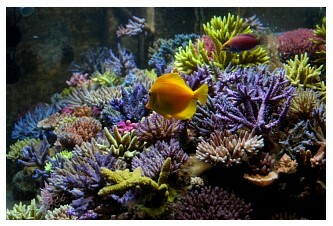 Because this is a reef tank, not a fish tank, the fishes' reef suitability is crucial. The fish in my collection were chosen based on their colors, shapes, patterns and, most importantly, their behavior and personality; generally, I try to pick fish that are active and swim in the open. Angelfish and tangs make up the vast majority of my fish load, and the rest are smaller fish such as wrasses and anthias. Some of the fish are mated pairs. The live rock in my tank is structured to leave more space on top, at the back and beneath; midway in the tank there are also lots of caves under the rocks. Mated pair of Maroon clownfish (spawning every few weeks) – 2.5” (male), 3.5” (female). The male is maroon colored with (gold) yellowish markings, and the female has white markings. Feeding the fish is my favorite part of this hobby; and whenever I stand near the tank, the fish in my aquarium swim near me to beg for food. I feed my fish 8 to 12 times per day; a timer is set to feed my fish twice in the morning and twice in the afternoon. I feed them as many times as I can, to make sure they stay healthy and a little overweight. 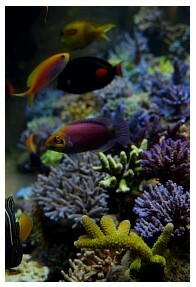 The fish are fed Ocean Nutrition Marine Pellets and Spectrum Marine Fish Formula 1 and 2. Also, I feed them a small amount of frozen Cyclop-Eeze once every week. 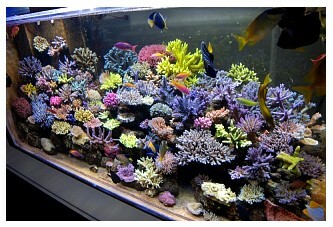 First and foremost, I would like to thank my wife, Emelina, for being so supportive throughout my reefkeeping journey. Her love for this hobby is almost equal to mine, and my tank would not be as successful as it is today without her contributions. I would also like to thank my family for their tolerance of my obsession. Many thanks to Skipper and the Reefkeeping Magazine team members for their dedication and hard work publishing this informative magazine. I would also like to give a round of applause to Reef Central, for its valuable advice and help. 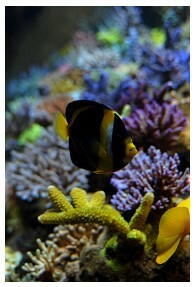 Last, but not least, I’d like to thank the Canreef society, where I have met a number of local reefkeepers who share my passion for reefkeeping, for their information on local aquarium news. Once again, thank you all for making my dream come true! All of the pictures were taken with a Nikon D80 with an AF NIKKOR 18-35mm 3.5-4.5D lens and an AF MICRO NIKKOR 55mm 2.8 lens.